Yuri Pimenov can be easily ranked as urban artists. Born in Moscow, he will forever remain faithful to the capital, from time to time portraying it in various guises throughout his work. So, according to the artist’s paintings, one can reconstruct the path that the capital has taken in its development since the 1920s. The new artist’s canvas, “New Moscow”, is widely known, in which he dresses his hometown in elegant, festive colors, conveying impressionistically exactly each of his slightly fussy movements. In the future (50-60s), the artist turns to the new quarters of Moscow. The artist admires them with a certain disorder, poetizes her, depicting female workers who wash their shoes or girls in puddles on pipes. Without a doubt, the painting “Roads”, painted in 1969, contains all of the above motifs. In the foreground of the canvas is a woman who walks along blurred paths and is sent, judging by the pelvis in her hands, to the river. In her gait and the whole figure, she is confident, although we don’t see our faces. Not traced as the faces of people walking toward a woman. And this is not surprising, because urban landscapes were and remain the main character in Pimenov’s paintings; they are the main focus. 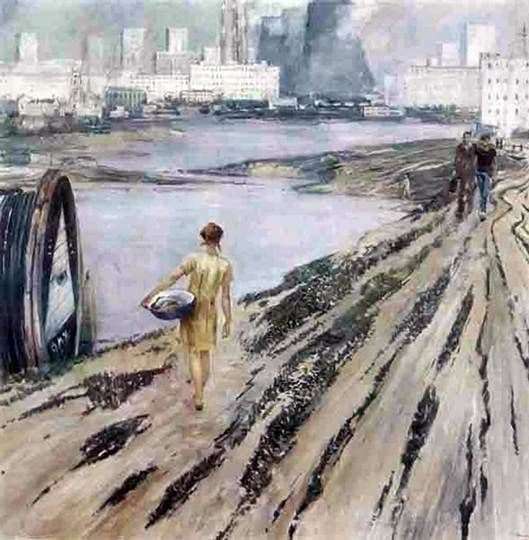 In the background, the picture can see the outlines of the city, its houses, which seem to be obscured by haze, which gives the impression of impressionism to the film. In comparing the unfinished quarters and buildings of Moscow, one can look at the hidden meaning: the artist says that someday, in the very near future, these suburbs will also turn into a beautiful and festive city. And the bad roads, which became the main motive of the canvas, will be dressed in asphalt clothes. This explains the confidence of the main character in the future.